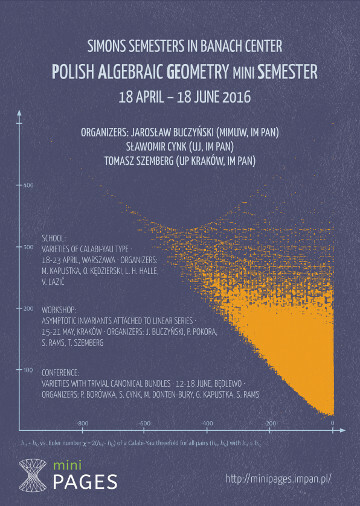 The conference will be a concluding event of the mini-semester on Algebraic Geometry organized by the Institute of Mathematics of the Polish Academy of Sciences and Banach Center. The conference is co-finansed by the Warsaw Center of Mathematics and Computer Science. Conference will be held in the period 12.06.2016-18.06.2016 in The Mathematical Research and Conference Center (MRCC) of the Institute of Mathematics of the Polish Academy of Sciences in Będlewo (30 km from Poznań). Sunday, June the 12th is the arrival day and Saturday, June the 18th is the departure day. On the afternoon (evening) of Sunday, June 12th, there will be special buses from Poznan (central railway station and/or airport) to Bedlewo. Their exact departure time will depend on the arrival time of participants. Please inform us about the date, time and place of your arrival to Poznan as soon as you know your journey schedule. There will be buses from Bedlewo to Poznan on the morning of Saturday, June 18th, as well. The participants will be accommodated in the conference center (MRCC). A night in single room costs 130 zloty (PLN) per person per night (less than 35 euro), whereas the price of a place in a double room is 120 PLN per person per night. Meals (breakfast, lunch, dinner) are included in the price. The first meal is dinner on Sunday and the last one is breakfast on Saturday. Lawica airport is Port Lotniczy Lawica; the central railway station is PKP Poznan Glowny). If you arrive on Saturday you may consider to stay in Poznan (every main booking service provides a good variety of offers). The most convenient way to reach Będlewo by public transport is to take a local train from Poznan Central Station (Poznań Główny) to Mosina, which is 9 km from Będlewo, and then take taxi from Mosina to Bedlewo (approx. 40-50 zł, 10 Euro). The bus connection is not recommended because the nearest bus stops are Dymaczewo Nowe (3 km east) and Będlewo Skrzyżowanie (2.5 km west). The directions to Bedlewo can be also found here. If your lodging costs are not supported by the conference, you can pay at the center with cash or credit card. The conference center provides wired and wifi internet connections in all rooms, lecture rooms are equipped with blackboards and overhead projectors. If you have any further questions, please contact one of the organizers.